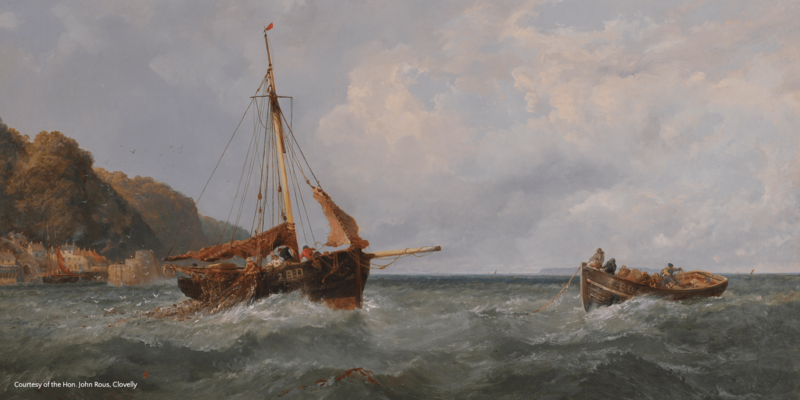 The Society was founded in February 1839 as a result of the tragic loss of a fleet of fishing boats on the north Devon coast in October 1838. Since then we have grown to become one of the largest national maritime charities. Our main purpose today is to provide financial support to individuals in need who have worked at sea in the Merchant Navy and Fishing Fleets and their dependants. While our title is now more of a metaphor for what we do, shipwrecks still occur and we are there to provide assistance. Explore our timeline to find out more about how our charity came to be and the events and developments that have shaped us over the decades. On Sunday 28 October, 11 fishing vessels with 26 men onboard left Clovelly harbour for nearby fishing grounds. The fleet encountered a ferocious storm, after which only two vessels returned and 21 men were lost. Hearing of the tragedy, Mr Charles Gee Jones, a former Bristol pilot and landlord of the Pulteney Arms in Bath, suggested to Mr John Rye, a retired ‘medical man’, that something should be done to assist the widows, orphans and parents of the fishermen and mariners who lost their lives at sea. The Shipwrecked Fishermen and Mariners’ Royal Benevolent Society, better known as the Shipwrecked Mariners’ Society, was established by John Rye with the assistance of Charles Gee Jones. The Society’s objectives were to give “relief and assistance to the widows and orphans of fishermen; and of mariners, members of the Society, who lose their lives by storms and shipwreck on any part of the coasts of the United Kingdom, while engaged in their lawful occupations; and also to render necessary assistance to such mariners, soldiers, or other poor persons as suffer shipwreck upon the said coasts”. The Society’s first public meeting was held on 21 February. Her Majesty Queen Victoria was its first Patron and ever since the Society has been honoured by Royal Patronage. See Patrons below. The Society’s distinctive flag was introduced in 1844. A distinguishing number was placed in the centre of the cross to identify the vessel to which it was assigned. Arrangements were made through private telegraph stations and then the coastguard to report the numbers on the flags displayed by vessels passing their stations and these in turn were reported to the Shipping and Mercantile Gazette. This was later extended when homeward-bound vessels would report enroute sightings upon arrival at a UK port. By 1851, 2,380 vessels displayed the Society’s flag. Some vessels also bore the Society’s flag and number painted on a board to provide a more permanent means of identification. This proved its worth when, in 1851, the William, of Kirkaldy, foundered off Ballywater, County Down. The board was the only item of the vessel recovered, to prove her identity, and enabled the Society to assist dependants of the lost crew. The Society was incorporated by Act of Parliament, on which the Rules and Regulations are based. This was a farsighted document that in addition to its principal original purpose, gave the Society the right to establish Asylums and a system of lifeboats, and to build boats to demonstrate how much safer decked fishing boats could be. It would also allow it to pursue “any other objects, designs, or purposes of a benevolent character, for the benefit and welfare of all and every or any of the classes of men for whose benefit the said Society was originally established or those dependant on them”. 1854, therefore, the Society transferred its lifeboats to the Royal National Lifeboat Association (RNLI). The Belvedere Institution, providing a hospital for “worn-out and disabled merchant seamen”, was established through the actions of the Shipwrecked Mariners’ Society in 1865 and opened its doors to its first residents in 1867. In 1868, the Institution was renamed ‘The Royal Alfred Aged Merchant Seamen’s Institution’ after its Patron, Prince Alfred, His Royal Highness (HRH) The Duke of Edinburgh, who was also the Shipwrecked Mariners’ Society’s President from 1883 to 1901. The Royal Alfred Aged Merchant Seamen’s Institution went on to become The Royal Alfred Seafarers’ Society. Find out more about the contribution of the Shipwrecked Mariners’ Society and fishing and merchant fleets to both World Wars. Buying Shipwrecked Mariners’ Society greeting cards can be a great way of supporting us. We have a full range of charity cards and gifts! If it wasn’t for our supporters, we could not provide seafarers and their families with the essential help they need.